Green screen video production give you the flexibility to record from any location, with any background. From still images to virtual sets… the background replacements are only limited by your imagination. Digitally replacing the green screen background scene is also known as chroma key compositing. In post production the editor can change the background imagery and easily add graphics that float behind the main subject. You also have the option to use a teleprompter so that you can record longer scripts. Green screen is the most common color for choma keying because camera sensors are the most sensitive to green. If you look at a color wheel, chroma key green and blue are colors that are opposite of skin tones. Green screen beats blue screen partially because it is not a color commonly worn by talent. When your subject wears green, you’ll want to shoot with a blue screen. 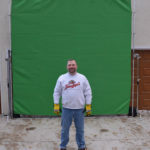 Green screen shooting can be recorded both indoors or outdoors. Our largest portable setup for green screen location shooting is a 12′ x 12′ digital green fabric and frame that mounts between two c-stands. Larger sizes (20′ x 20′ or 20′ x 40′) are available from a nearby production rental house. We offer smaller setups for tighter spaces. When shooting indoors, the green screen and subject is lit with tungsten lighting and soft-boxes. You don’t need to build a fancy set because with a green screen you can shoot anywhere and replace the background with a stock photo, video element, branded graphic or virtual set. We can also help you shoot video in a green screen studio that features a two wall corner cyclorama (36’ x 44’ wide and 20′ high). Call us for availability. Footage shot with a 4:4:4 or 4:2:2 color sampling ratio is much easier to key than a sampling rate of 4:2:0, which typically leaves a ring of pixels around the edge of the subject. We use advanced chroma keying software to remove the halo, but cameras that shoot with a ratio of 4:1:1 or below are not an optimal option for chroma keying. When you’re shooting green screen you want to record the highest quality footage with the most range. Choose a camera that records larger files at a higher bitrate and with less compression. A smartphone or DSLR are going leave lots of artifacting around the edges of your subject that are going to be hard to cleanup in post. Most of the time portrait photography is shot with a background it is shot on black, white or mottled grey background. But green screen photography gives you more flexibility with the background. Just like video the background can be replaced with virtually any image. The final step is separating the foreground subject from the background subject (chroma keying) and replacing it with a new background (compositing). This process starts by using software to make the background transparent. If your subject was shot in front of a smooth, bright, evenly-lit background and your subject was lit independent of the background then chroma keying and compositing should be relatively easy. Color, perspective, depth-of-field of the right background plate can really add to the natural look of the final composite. Advanced lighting techniques help the video look natural. The final result should be a video doesn’t look like it was keyed. For a history and more information about chroma keying, check out this article on Wikipedia. Lawrence Butler won an academy award for his special effects in the 1940 film The Thief of Bagdad. Contact Mediapolis to learn more about recording your next video using green screen video production.